There was so much going on this weekend! I’m glad to finally have a quieter day. The kids have a long weekend, thanks to parent/teacher conferences and Washington’s birthday, so they had Friday off. I drove downtown to take the girl to a weekend-long honor band, and that was only a little stressful for my small-city-driver self. The fun bit was that we met a knitter from Vietnam! During our downtime, we hung out at the B&N cafe, and I was knitting a Yoda hat. An older woman came over and asked where she could get needles like mine (I was using my 12″ Addi Turbos). She lives in Vietnam and comes here to visit her son, who attends the local university, so she didn’t know the area well at all. She was really only familiar with Michaels stores, and didn’t seem to understand the concept of local yarn stores (so sad). We chatted a bit as best we could with the language barrier, and it was neat to share the love of knitting. It made me realize that’s really the only time people come up and talk to me, when I’m knitting. It must be a good ice-breaker! Either that or I suffer from RBF (Resting B*#@% Face) when I’m not knitting. We may never know. Saturday morning was my craft show and it was a whirlwind five hours. 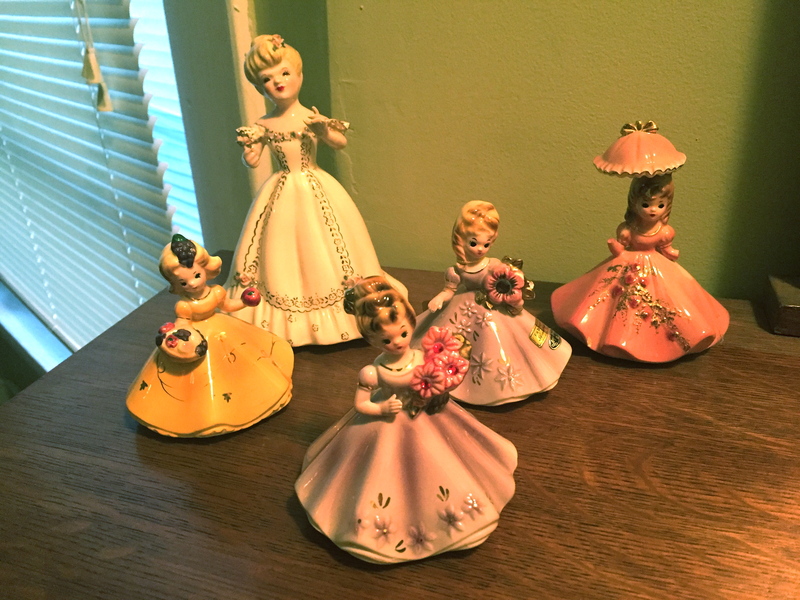 I had some family visit me (and buy a couple of things) but I also had several real customers too! I focused on hats for this show, and I think I sold 6 or 7. The Yoda hats were a hit, of course, but so were the black hats. Note to self: make sure to have black hats at every show. My Knitting SIL was up there with me, and we had a grand time knitting and chatting between customers. Really, it went much better than I expected, and it makes me think that focusing on hats might be a good strategy. 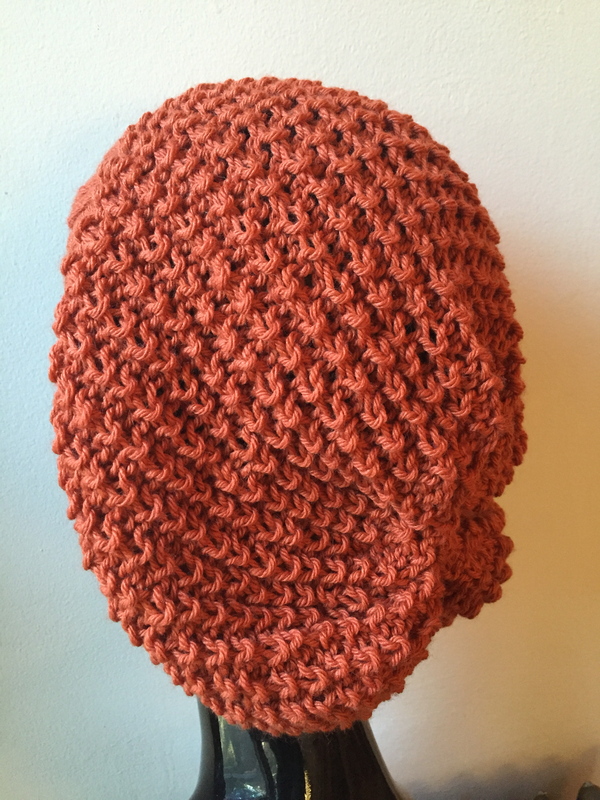 But…I LOVE cowls! Love making them, love wearing them. Why don’t people buy them? I just don’t know. Still, hats are good. I like hats. 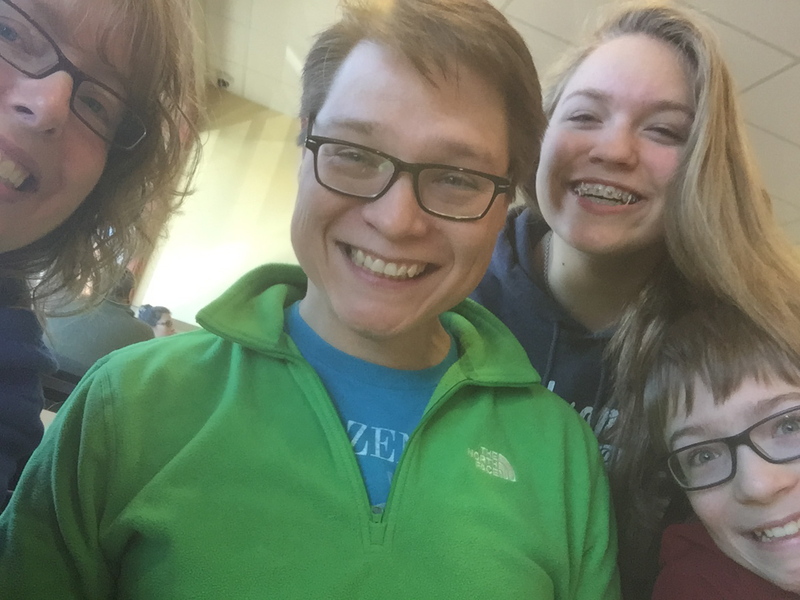 Yesterday was the concert for the girl’s honor band, and though it was a struggle to get the boy awake (forget about happy) by 9 a.m., we managed. The concert was marvelous… and the lunch afterward was marvelous too… Look: the boy has a new hairdo! It was a bold move for him; we love it! And look: the girl has a new smile! She got her top braces off finally and is SO HAPPY! Then we came home and I took a bunch of photos of my newer hats and updated my Etsy shop. It’s all current now, and I’m going to step back from Yoda hats and work on the rainbow cowl for my mom. But now I have a question for you fellow sellers of knitted goods: I was invited to do a show in June. It’s a good show, well-advertised and popular, and the booth fee is very reasonable. BUT, that’s the middle of summer. It’s warm here then. 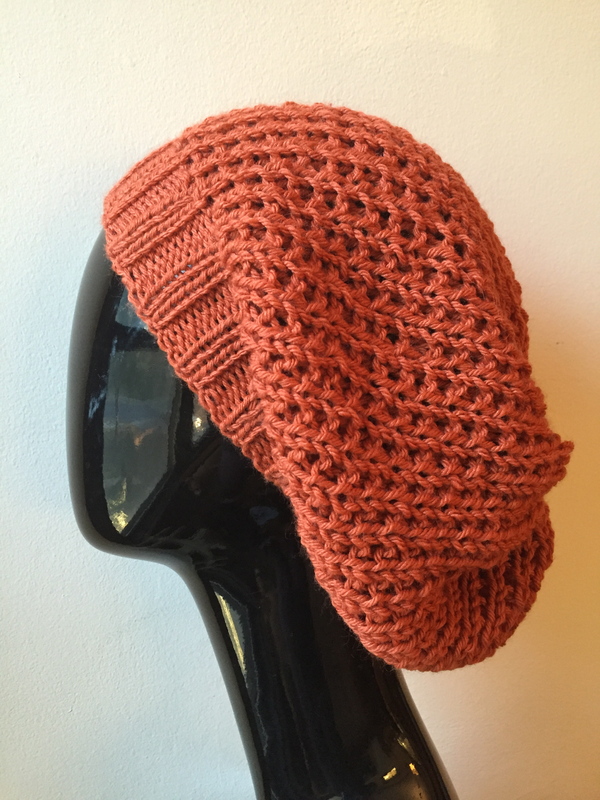 How well do knitted things sell during the summer? In my experience, not that well. I can modify my inventory a bit, have more summer-weight hats, baby hats, cotton bags, etc, but I’m not sure I’d have enough for a show. Have any of you done well with summer shows? What advice do you have for me? I will wait patiently for your replies, as patiently as Jack waits when it’s dinner time. (Sorry the photo is so bad; I had to take it quickly before he moved.) I just love how he sits! This is not ideal. If you remember, I managed to acquire some tendonitis in my elbow over the summer, and I’ve been battling it ever since. Well, being on crutches has made it worse, as has all my extra knitting time while I’ve been resting my foot. I’m not supposed to take anti-inflammatories because they’re not the best meds for my foot, but the pain meds I do have don’t do anything to help the elbow. Sigh. So right now I have a really sore elbow and I know I need to quit knitting for a few days to let it rest. I’ll try working on the crochet mermaid blanket, since it’s a different set of movements and uses the right (good) arm more than the left. But these might be the last knitting photos for a while. The doggy scarf! It’s about 2 1/2″ wide and 13″ circumference. I really hope it fits well. 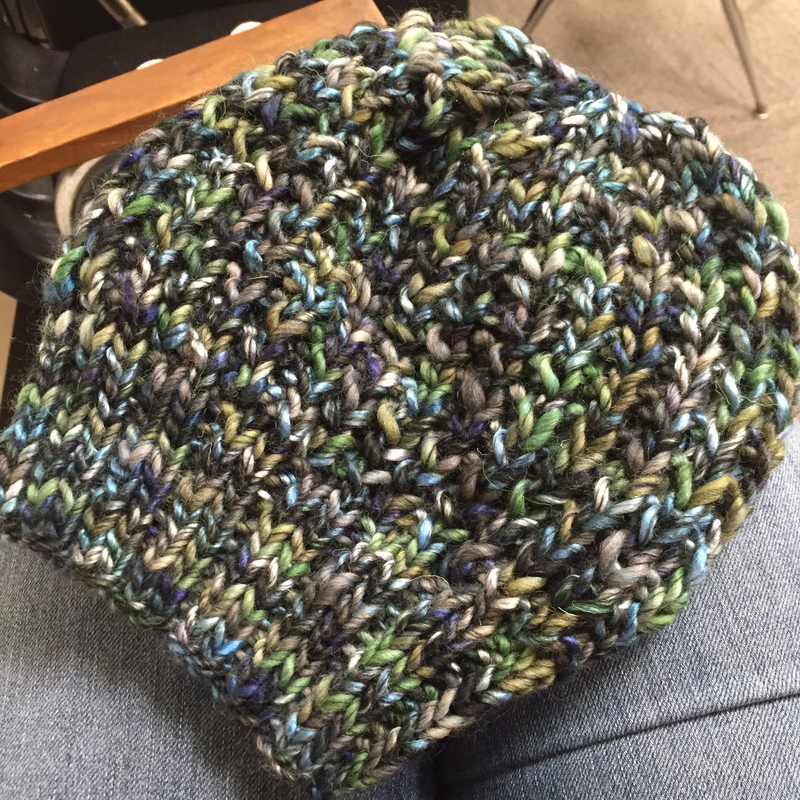 Another Broken Rib slouch hat, this time in Oscar the Grouch Green. This is the last piece for my craft show, which is tomorrow! I can’t say I’m looking forward to it, but that might just be because of how hard it is to shower/look presentable right now. I’m sure once we get there and get it all set up, we’ll have a grand time. And maybe I’ll sell a whole bunch of hats! Maybe whining really does help: I ended up having a pretty good day yesterday! I managed to make it up to my craft room, where I spent a lovely hour or so prepping my for craft show. 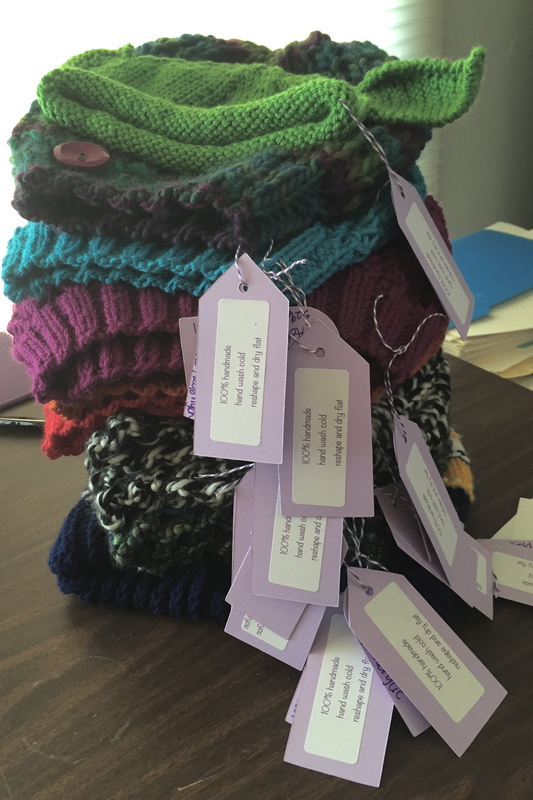 I had a big pile of finished hats with no tags. So I pulled out the Sizzix, made some tags, and got them all ready to sell. I also had a few that needed some finishing details before I could sell them, so I gathered up the supplies I needed and worked my way downstairs. NOT the couch, the dining room, with all the sunshine. I turned on my music (Imagine Dragons. Love them.) and set to work. On the second Yoda hat, I ran into a snag. 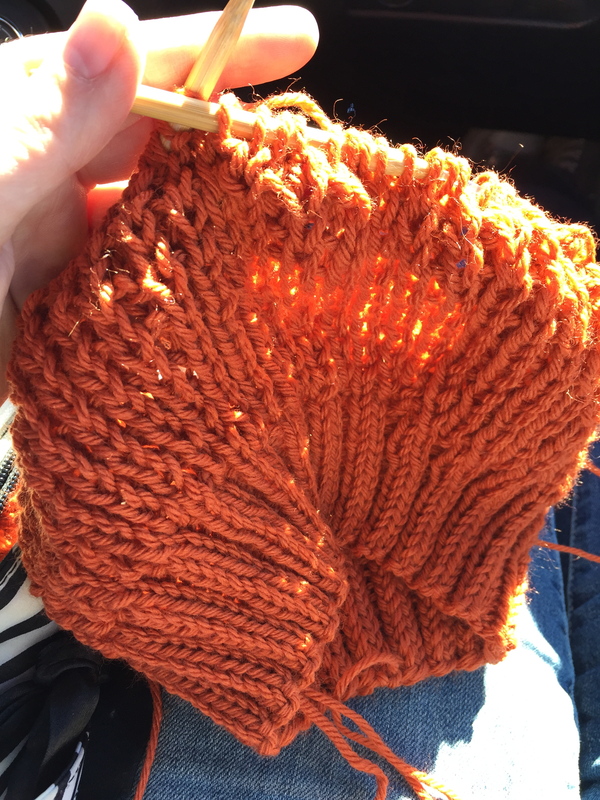 I’d finished an ear with a new skein of yarn and realized in the harsh light of day that it was the wrong color. Oops! Frogged that. 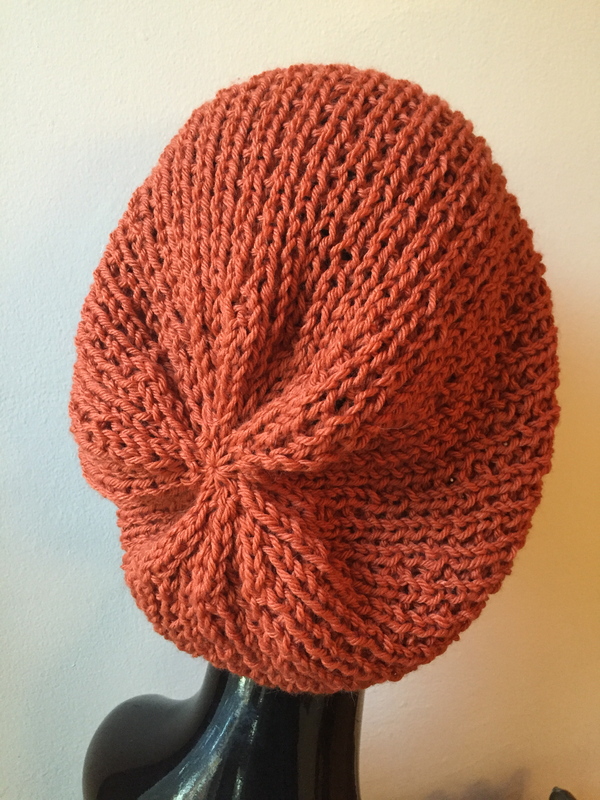 I found a leftover bit of the right color, reknit the ear, and sewed it onto the hat. 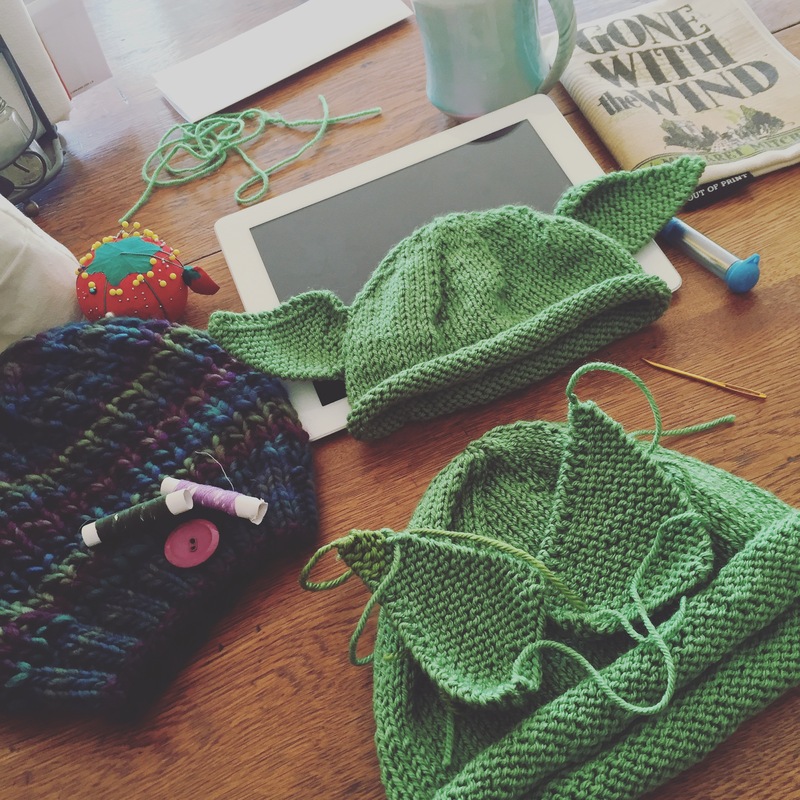 Bam, another Yoda hat done. 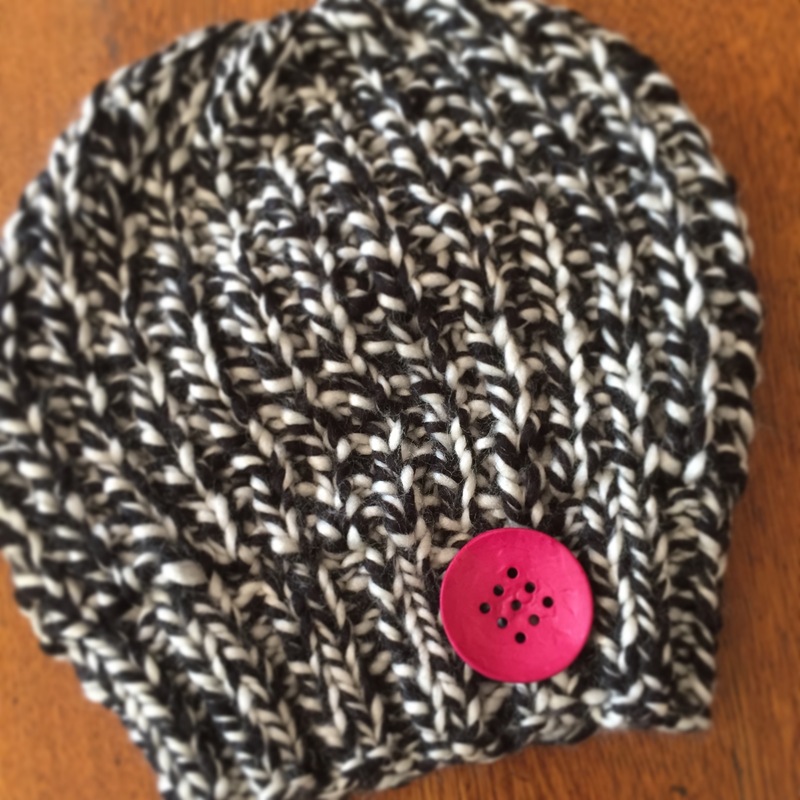 I added a button to a hat. I didn’t have matching thread, so I used a contrasting color, and I’m quite pleased with it. As I sewed, I noticed the top of the hat was pretty cool. The color in the photo isn’t great; it’s a greener green than this, but you get the idea. I love it when the yarn does fun stuff like this all by itself. By then, I’d been up for a few hours and my foot was starting to ache, so I gave in and went back to the couch. But it was good, because I finished the candy cane scarf, a holiday order that’s been hanging over me and preventing me from selfish knitting. Okay, so I messed up and made it 6″ shorter than it was supposed to be, but thankfully my customer didn’t mind. 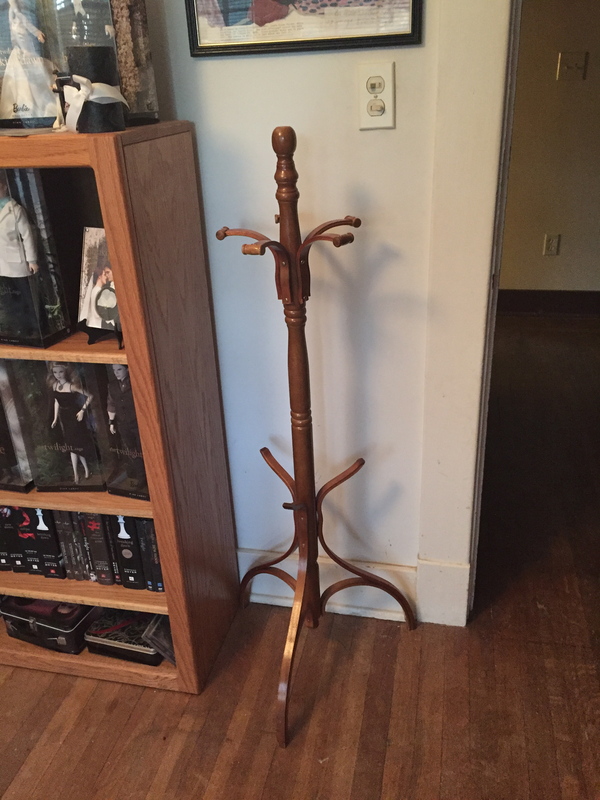 (It probably helped that I offered it at a lower price.) Jack was very happy that I was back at the couch. He needed some cuddle time. I’m also getting close to the end of the mermaid blanket. I’ve joined it to work in the round and I’m ready to decrease, then it’ll just be the fin and it’ll be done! Woohoo! Okay, it’ll be done AFTER I weave in 50 million yarn tails, but still. I’m close. So yeah, good day yesterday. 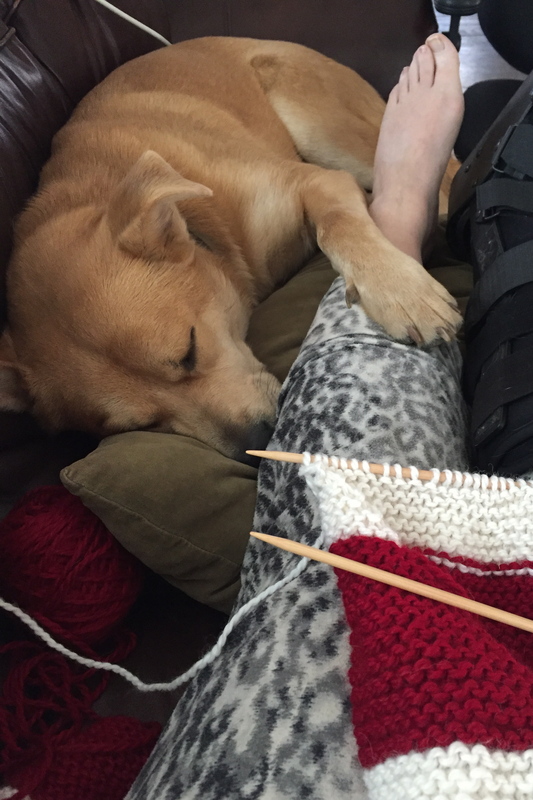 Thank goodness for yarn and puppies and helpful kids and a loving husband. And thank goodness for encouragement from all of you! 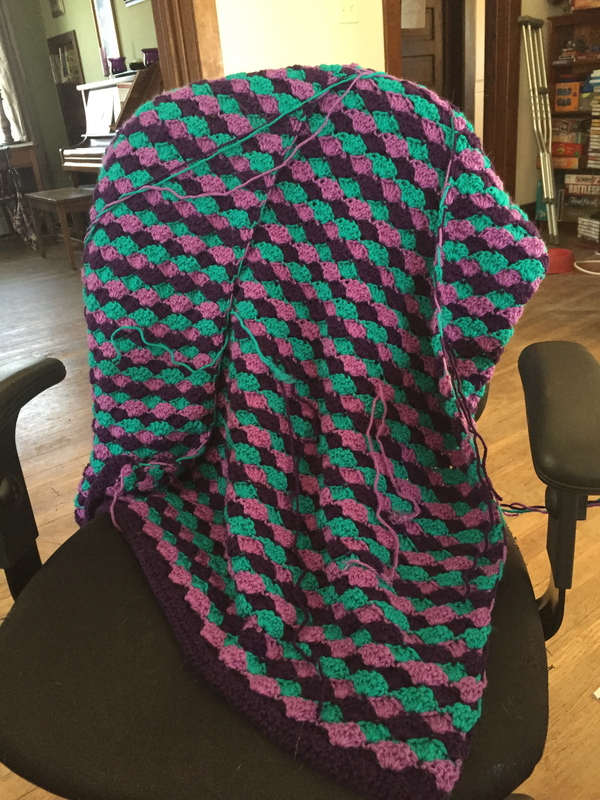 I might be…a good knitter…maybe? Sometimes? 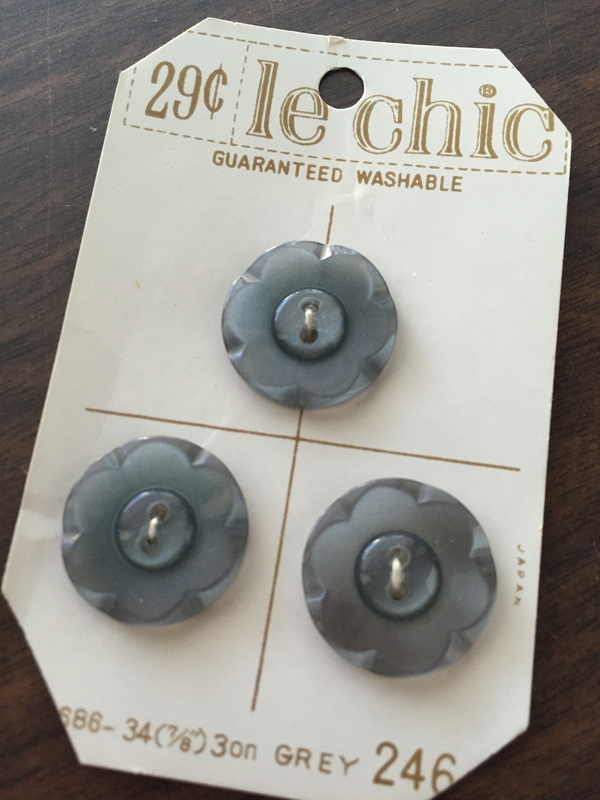 I got a fantastic email last night, another thank-you from a happy Etsy customer. This one turned into another special order, so now I’m making two more scarves before December. That’s added on to a mermaid blanket, an earwarmer and two pairs of fingerless gloves. Whew! I’m gonna be a busy gal. I better get out my elbow support and just start wearing it every day. 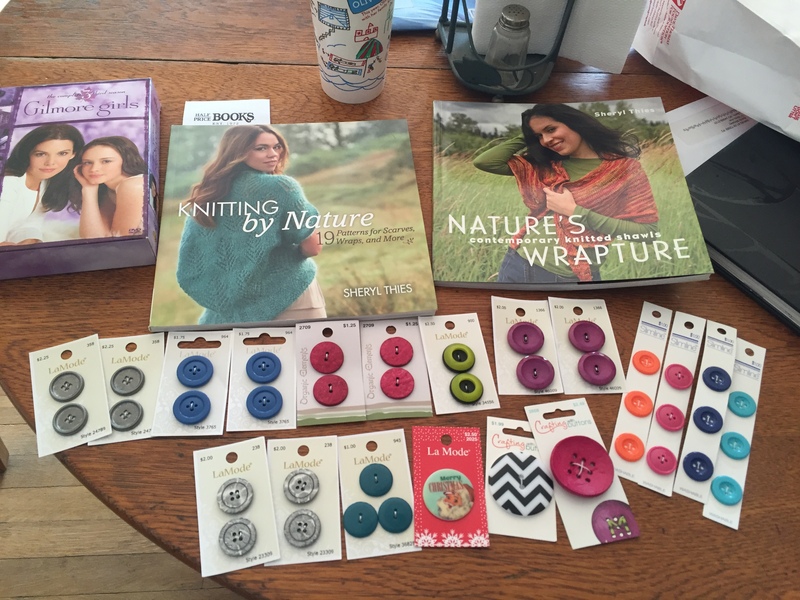 Never in my wildest dreams did I ever think I would have any kind of knitting-related business, not before a couple of years ago. 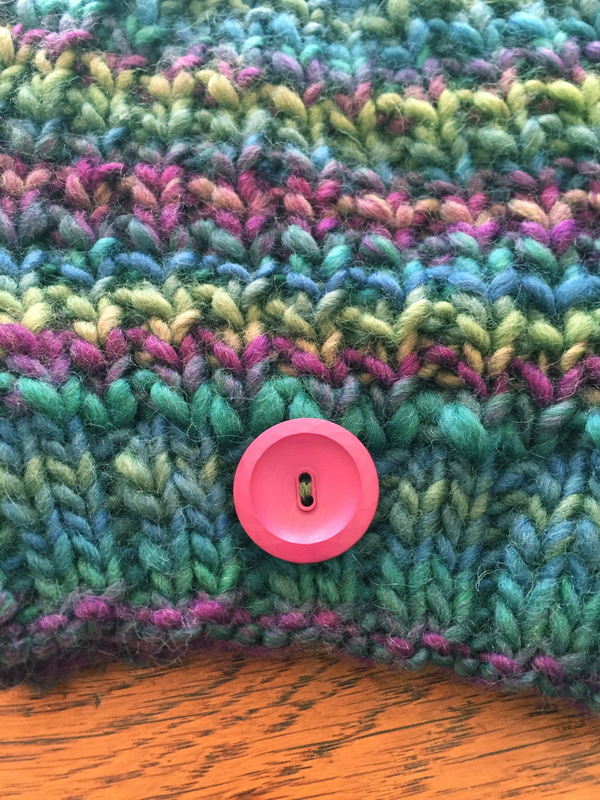 But then I learned to knit in April 2013, and now here I am, with glowing reviews from Etsy customers and craft show customers, repeat business from those customers, special orders, and it feels…perfect. I feel so very lucky. It’s hard for me to think very highly of what I do, because it’s not that special, it’s not unique. 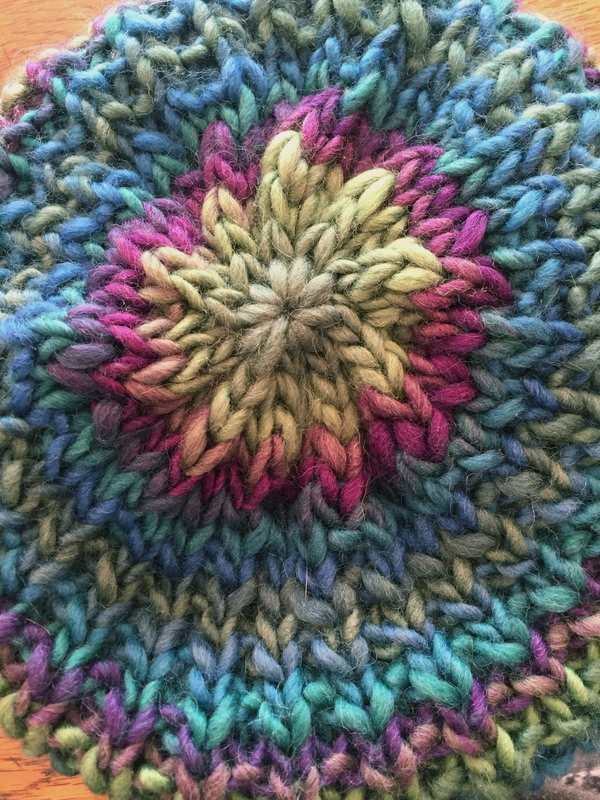 Many people knit just as well as I do, and many do more complicated, unusual patterns than I do. And that’s okay. I’m happy where I’m at with my knitting. So why am I succeeding now? No idea. My attention to detail, maybe. My commitment to customer service (thank you, Coldwater Creek), maybe. I put myself into what I make and I share myself with my customers (and all of you!) and I think people respond to that. I don’t really have the answer, and that’s okay too. As long as I can keep doing what I’m doing, it works for me. It’s not like I’m making a ton of money. Nowhere near it. 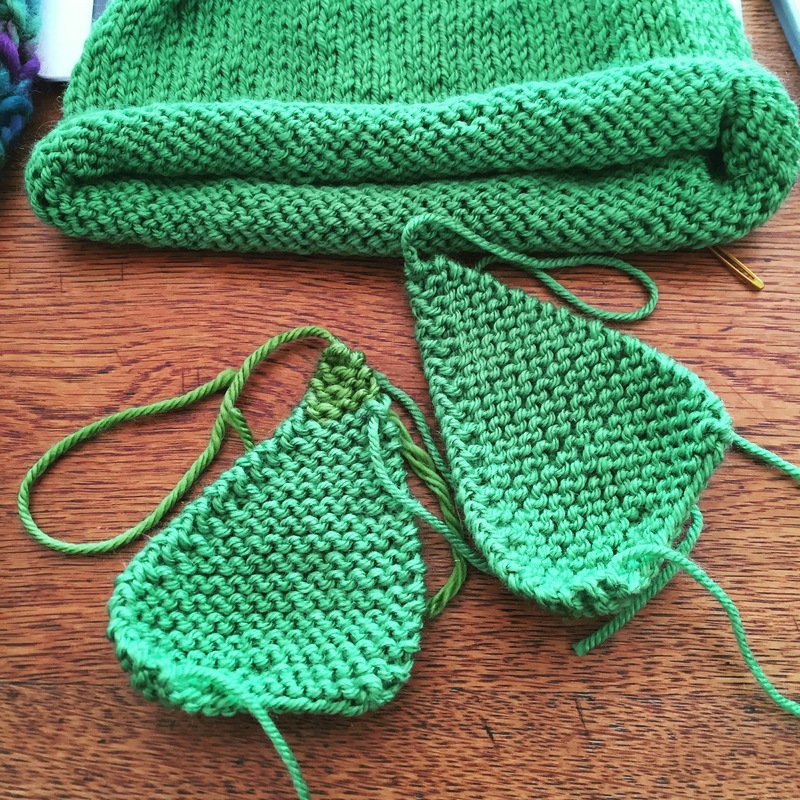 But I’m at a point where I think the knitting can be self-sustaining financially and that’s huge. (That’s also assuming I can resist big splurges at the yarn stores!) And I think if I keep at it, I might actually profit someday. Wouldn’t that be cool? Yep. Very cool. This weekend might have been my last free-knitting time before I plunge into all those custom orders. 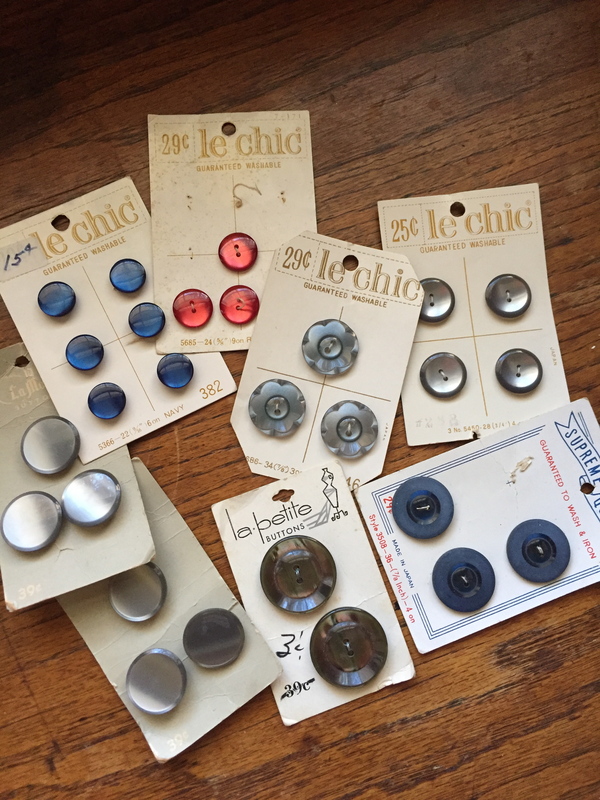 I splurged on some buttons recently, wanting to make more button slouch hats before a craft show next month. I decided the big pink one was perfect for the black and white hat. 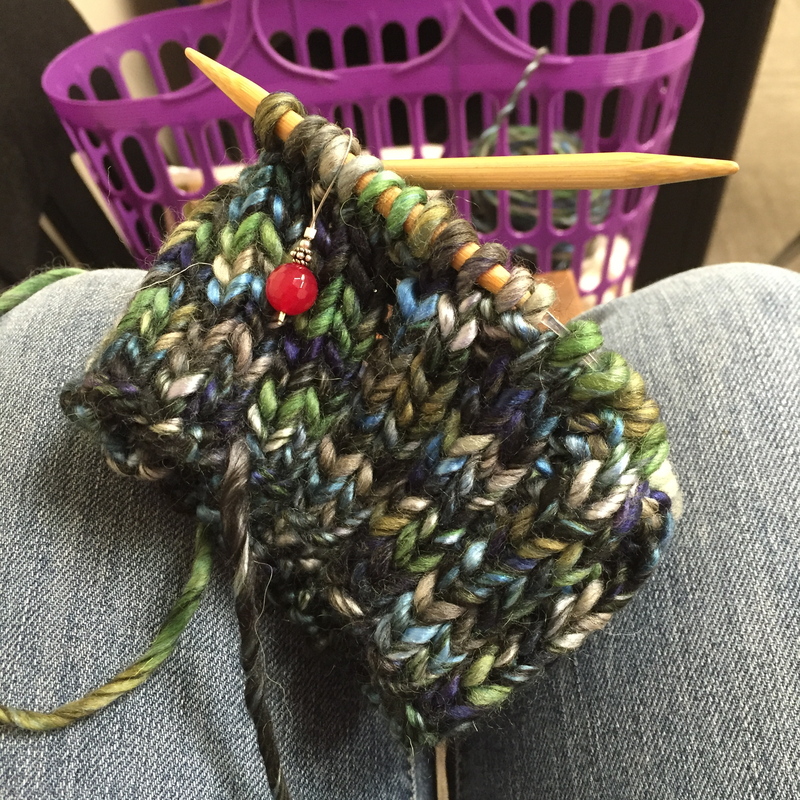 Yesterday I spent a couple of hours listening while my daughter rehearsed with her local honor orchestra, and cast on for another Borealis beanie. I was done 20 minutes before they were. 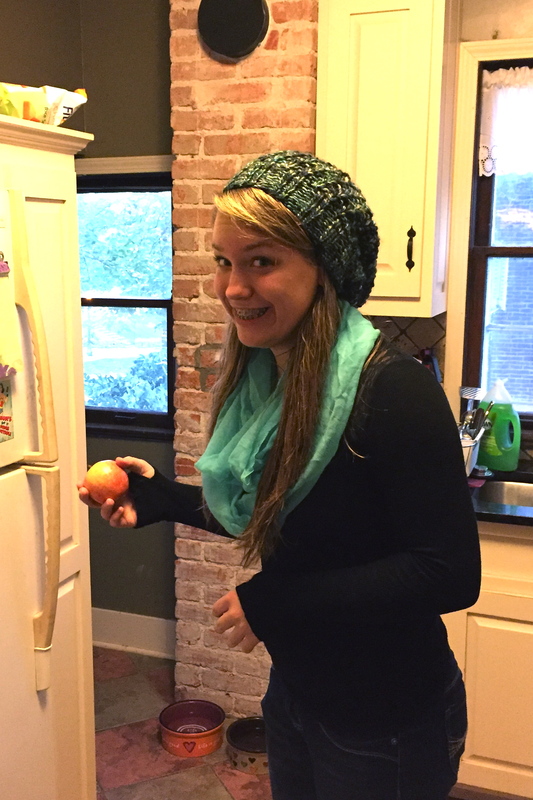 The girl saw the hat and promptly stole it. This is the same girl who spent an entire day off school making cookies to sell to help offset the cost of the tuition for that orchestra. Voluntarily. So, she wants a hat, she gets a hat. How can I resist when it looks so cute on her?